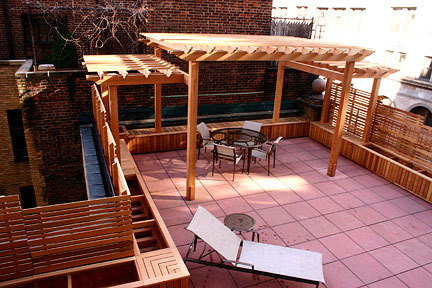 An opportunity to collaborate with a garden designer and an architect resulted in this rooftop respite in Manhattan. The pergola, stabilized by the planters, provides an open yet intimate enclosure amongst the neighboring city buildings. The planters will soon host an array of greenery that will surround the terrace. 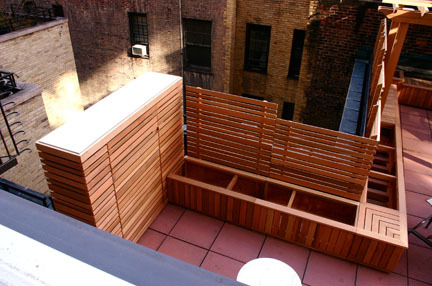 The planters also help to support the slat wall that provides an element of privacy and a trellis for the vines. The slat wall motif was carried to the back wall and used to create a large outdoor storage closet. 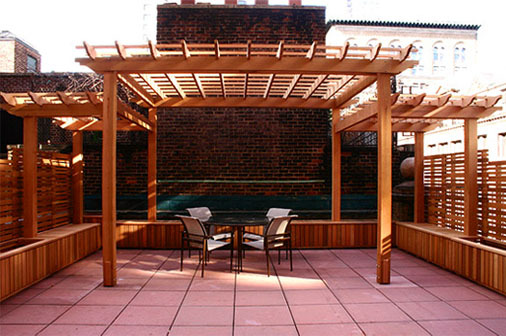 Multiple challenges were met in designing this outdoor living space, including designing the sections to fit in an elevator in this New York City apartment building.